Santa Barbara is a beachy town 130 kilometres north of Los Angeles that's often referred to as the "American Riviera" because of its warm climate. It has white sandy beaches perfect for sun-worshipping, and the beauty of this Spanish mission-style town is that you can choose from busy cosmopolitan beaches like East Beach near the famous Santa Barbara pier, through to Hendry's Beach where you have privacy and deserted stretches of white sand yet plenty of facilities. Or for a long stretch of gorgeous white sand, try the easily-accessible City Beach which rolls into State Beach. This is the locals' favourite stretch of beach, and the beauty of State beach is that you can still set up camp on the beach without being told to move. If you're after beach sunsets, try Butterfly beach which faces true west. This is almost like the Malibu of Santa Barbara, a private beach with plenty of expensive houses near the beach and plenty of interesting characters on Butterfly beach. 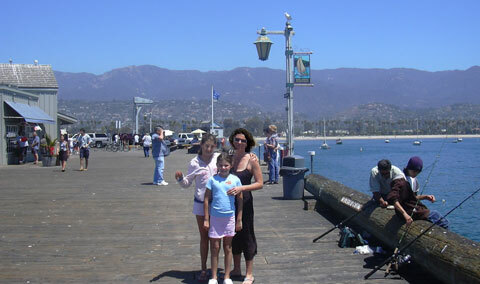 Americans love their piers, and the pier at Santa Barbara Beach is up there with the best of them. You’ll find a cluster of restaurants, shops and stalls all with great ocean views. Strict planning in Santa Barbara has made this laid-back beach town an attractive spectacle. On arrival, you're greeted with the alluring sight of mostly whitewashed Spanish mission buildings and terracotta tile roofs. This and some of the best beaches in America have made Santa Barbara one of the most refreshing destinations on the US west coast. The open air restaurants are wonderful in Santa Barbara’s balmy weather. Try Carlito's Cafe on State Street, the main street filled with restaurants. Carlito's is Mexican-American food with a delightful alfresco area surrounded by those ubiquitous whitewashed walls with a lively Mexican band playing on Friday nights. 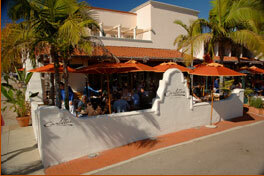 As you may have guessed Carlito's is a local institution, so make sure you book or be prepared to line up and wait. The strict planning in Santa Barbara has made the drive through town an attractive one because billboards are banned, so much so that you won't even see them on the freeway 30 kilometres near Santa Barbara. Santa Barbara is a must-see beach town on any trip between LA and San Francisco. If you're headed north, stop at Big Sur (sit on the chairs in the stream behind the cafe), Carmel (where Clint Eastwood was the real-life mayor) and Monterey (try the Seven Gables Inn).